Of course, she may solve the mystery of who this ghost is. BTW, who is their advisor? Bryn Andersen. School principal and, more recently, Katherine’s significant other other. Bryn is the principal, not necessarily the advisor. She’s dating the mother of two of her students, that answer your question? I’m getting the feeling Scarlet doesn’t want to go through with this. Scarlet, dear . . . you’re going to get a headache doing that . . .
And you’re going to need to be thinking clearly – you have a decision to make: Do you go along with it in hopes of being able to deal with whatever disaster they create, or do you wash your hands of it? Wait … yesterday he said “Paranormal sweep.” Thing is, THEY are paranormals. The whole school is crawling (literally) with paranormals of one sort or another. How are they going to distinguish between themselves and other paranormal entities? Or between lingering effects of the pupil’s and staff’s paranormal activities and “ghosts” paranormal activities? Residual energies must be all over the place all the time. Even when everyone has gone home. Maybe it’s a sweep by paranormals…? Perhaps Daylla was referring to a sweep specifically to catalog and eliminate the expected activity by the paranormal students and staff from consideration. If they have the tech for it, someone has probably compiled measurements of the energy signatures of most kinds of paras, so they can check their readings against a list of the para types who are supposed to be at the school and pick out anomalies. I see someone getting hit with that checkovs gun that was established like a year ago. C’mon…Castela is a plant. This hominid stuff is hard…even for hominids. That feel when you suggest a perfectly sound, reasonable and logical course of action and the rest of the party ignores your advice and decides to do the exact opposite. It’s almost like a compulsion to do so. It took me a while to connect the dots, but I eventually figured out why the military is so insistent that people follow orders. It gets the troops in the habit of not obeying orders. Scarlett: We should not do that thing. Everybody Else: We are doing the HELL out of that thing! Research the history of this room by planning for a future event there? …Is it just me, or does something about this seem to be a bit…off…about this idea? I’ve been wondering why they didn’t investigate this room first before going after some random abandoned building. They know they have ghost sign here — why wouldn’t it immediately become their top priority? Looks like Scarlet hasn’t told them any of what she learned about her grandmother and her own abilities, though. Wonder why not? 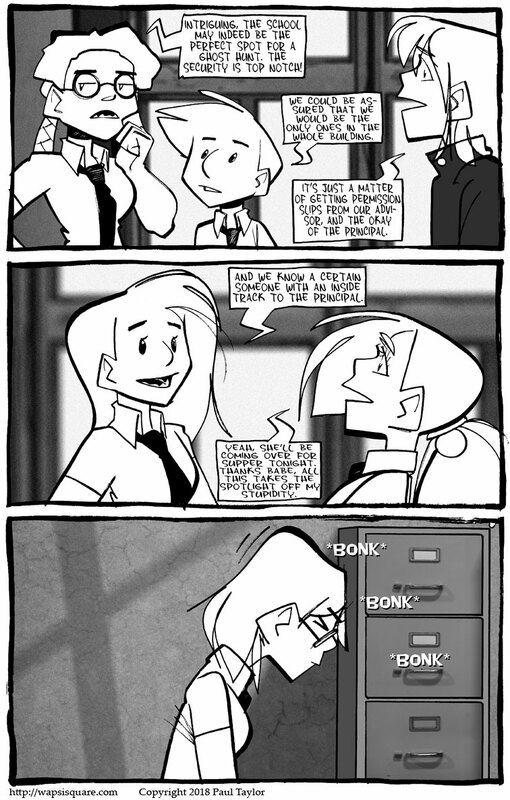 I wonder if Daylla’s & Castela’s exchange, in the 2nd panel, has anything to do with Scarlet *bonk*ing her head against a file-cabinet.